I loved Irish as a primary school child. I was good at it too. It was probably in my blood as my maternal grandfather was a Gaeilgeoir. Just after I started third class, aged 8 (days from being 9), we packed up and left to live in Zimbabwe (Southern Africa) for a number of years. Funnily enough we didn’t study Irish in Zimbabwe (we did do Ndebele!) and when we returned to Ireland I entered secondary school I was excused from it. After three years of secondary school, and having completing the first State Exams, I did a transition year. It was optional but it gave those doing it a chance to take a year off the formal curriculum and try different subjects. Rather than Irish, the year offered Irish studies so I opted to join in. I loved it and decided to make it my business to pick the language back up again and do it in my final State exams, the Leaving Certificate. I passed. I was thrilled. Unfortunately my grandfather died just before so I didn’t get to tell him. Of course I have forgotten most of it now. Like any language you need to keep using it. Two of my kids are now in primary school themselves. They have now started learning Irish and no doubt the time will come for me to have to help them. With this in mind I was thrilled to be contacted by Claire O’Gorman, primary school teacher turned entrepreneur, who created Smarty Cat Games in 2012 with a view to helping children learn Irish in a fun and exciting way. If you watched RTE’s Dragon’s Den you will know that Claire secured investment from Ramona Nicholas. 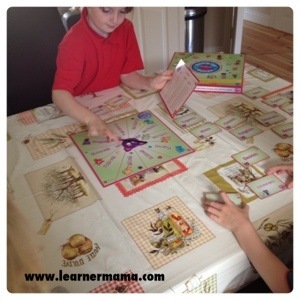 Cé mhéad Cat, a board-game to develop a child’s understanding of past, present & future irregular verbs. Cluichi Gaeilge, a suite of 10 different games which cover the ten themes in the national curriculum for Irish, ideal for the classroom or at home. Claire sent me the board game Cé mhéad Cat and a Chatty Cat Ball. We have just started getting into board games in our house and I think my kids are at a great age to start using them as a fun activity and what’s even better with Cé mhéad Cat is that they are learning as well as having fun. Cé mhéad Cat helps kids to learn the corresponding past and present tense of irregular verbs without the need for hours of learning off by heart. The players spin the spinner and have to match the past tense verb with the corresponding present tense verb on the card to earn as many points as possible. If I’m honest I found this game hard because I am terrible at Irish grammar (even with the useful instruction sheet and verb list that came with the game) and my kids are still very new to learning Irish. That said I am pretty sure I will have to brush up as I can see that as my kids progress through primary school their knowledge of these verbs will become essential. I, therefore, foresee LOTS of playing this game. My little boy in particular, who has only just started Senior Infants, will really benefit from this game as he gets older as he has a very short attention span when sitting down to do homework but give him a game to play and he will spend hours at it. 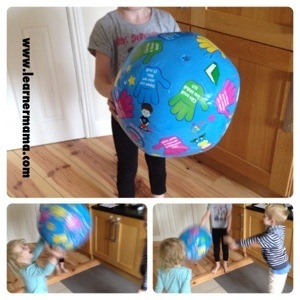 The Chatty Cat Ball was an instant hit and it has been flying around our house for days now. The idea being that children throw the ball to each other and ask whatever question or carry out whatever action their right hand lands. There are 21 questions and actions in total. My kids had great fun with the ball and I was thrilled to hear my 2 year old asking “Conas atá tú?” (How are you?). I think that the ball will come in to its own in another little while when they can all read and play together so it’s certainly something I will be hanging on to for years to come. It can be easily deflated when not in use and tidied away. With the school year starting up again I can imagine lots of fun in a classroom setting with the Chatty Cat Ball. My 7 year old has plans to bring it in to class to play with. I can’t wait to hear what they all think. Overall I think these products are really innovative and provide a fun way to learn. I am really delighted to have these two games as a support tool for my kids Irish lessons into future school years. They are bright and colourful and well suited to primary school kids. Depending on your kids level of Irish, they may suit the slightly older classes – 2nd / 3rd class upwards – better to get full benefit. 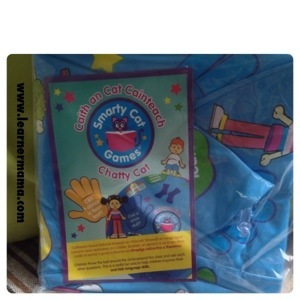 If you want to buy any of the Smarty Cat Games they are available online or follow them on the Facebook page. Disclaimer: This is not a sponsored post. I was not paid to write this post. I was however given a Chatty Cat Ball and a Cé mhéad Cat board game for the purposes of review. And the winner of the Milton giveaway is……. Definitely. They would suit your kids perfectly!